Volume 10 | Church Edition Curriculum | What's in the Bible? In Volume 10: Jesus is the Good News! [Matthew, Mark, Luke & John], your class will explore the 400 years between the Old and New Testaments, and then learn about the life and ministry of Jesus Christ from the books of Matthew, Mark, Luke and John. Volume 10 contains 4 weeks. Week 1: The children will review the stories of Matthew, Mark, Luke and John and discover God’s great rescue plan. Week 2: The children will learn about the New Testament. 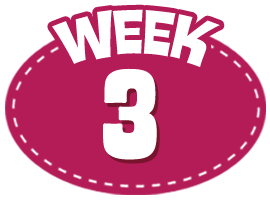 Week 3: The children will learn about Jesus the Messiah in the Gospel stories. Week 4: The children will learn about Jesus’ death and resurrection, and discover they can choose to be a part of God’s Kingdom. Video 1 Welcome Custom Welcome Video: Buck Denver spells out his name using the super-secret What's in the Bible? Word Code! Small Group 1 Relationship Building Everyone gets to spell out their names using the What's in the Bible? word code. Video 2 Learn: Where We Left Off Review the BIG concepts from the Old Testament in less than 5 minutes! Small Group 2 Old Testament Scramble Kids solve riddles and reveal pictures to show the answers to big questions about the Old Testament. Video 3 Learn: 400 Years Between Learn what happened in the 400 years between the Old Testament and the New Testament. Small Group 3 Buck's Build a Road For every correct answer, kids receive a piece to build a road - just like the Romans did! Video 1 Welcome Buck Denver uses the What's in the Bible? word code to reveal his favorite food. Small Group 1 Relationship Building Each child uses the word code to write their favorite food - who can guess it first? Video 2 Learn: Religious Groups Learn about the 4 Jewish groups at the time of Jesus - Pharisees, Saducees, Essenes and Zealots. Small Group 2 A Parrot's Football Game Children make folded paper footballs as they answer questions about the video, then enjoy playing until the next video starts! Video 3 Learn: New Testament This video explains the Gospels - what they are, who wrote them, and what they teach us! Small Group 3 The Picture Comes Together An art project that has kids color and put together two pages to show a full image. Video 1 Welcome Buck Denver shares his favorite hobby by spelling it out with the What's in the Bible? word code. Small Group 1 Relationship Building Everyone uses the word code to spell out their favorite hobby - and then take turns trying to guess what everyone else wrote! Video 2 Learn: Jesus the Teacher Learn about the early life of Jesus and the start of his ministry. Small Group 2 Jesus Share Cards This is a reflective activity in which kids draw, write and act out what they feel about Jesus. Video 3 Learn: Jesus the Messiah Jesus teaches, heals and performs miracles! Small Group 3 Messiah Maze or Jesus Stories Two activity options allow each small group to focus on either learning more about Jesus, or relating more to his stories. Video 1 Welcome Buck Denver reveals his favorite color using the What's in the Bible? word code. Small Group 1 Relationship Building Everyone shares their favorite color by writing it with the word code. Video 2 Learn: Jesus the Teacher Learn about Jesus' mission on earth - bringing the Kingdom of God to life! Small Group 2 Backwards Land A board game with a fun twist! Roll the dice behind your back and answer questions to move the pieces around the board. Video 3 Learn: Jesus' Death and Resurrection This video follows Jesus through Holy Week, his death, his resurrection and ascension. Small Group 3 Stations Set up 7 stations around the classroom for children to have different sensory experiences related to each part of Jesus' Holy Week journey.